No, I don’t mean the dreaded papers and exams that we just put behind us. I mean it’s over halfway through the semester so we’ll reflect on BSU happenings so far this Spring. As a centerpiece of our annual programming, we presented Black History Month 2014, “A Celebration of Blackness.” According to several faculty members and students, BHM 2014 was on point. We kicked off our heritage month on Claiming Williams Day by facilitating a Q&A with renowned poet of Striver’s Row, Joshua Bennett. The next day, we facilitated the thought-provoking interdisciplinary panel “Exploring the Implications of the Black Body.” The event featured Professors Nimu Njoya, Sandra Burton, and James Manigault-Bryant, as well as visiting visual activist Zanele Muholi. On Sunday, February 9th, we hosted Dr. Ibrahim X. Kendi to present a lecture on Revitalizing the Black Campus Movement. The following week, Professor Leslie Brown expanded on that revitalization in a dinner lecture on “Black Power in the Civil Rights Era”. On Thursday February 20th, students and faculty enjoyed a dynamite Soul Food Dinner prepared by guest chef Velma McAdoo. After the dinner, we fought the -itis and waddled over to Griffin 3, where scholar-activist Darnell Moore seamlessly blended theory and application in his lecture “An Interrogation of the Black Presence in the Queer Project”. The next day, we kept the food coming by cohosting a soulful Shabbat Dinner with WCJA. Noting that man does not live by bread alone, we hosted “Taste and See” A Celebration of Black Religious Traditions on Saturday, February 22nd in Thompson Memorial Chapel. This comprehensive church service featured a sermon by Rev. Dr. Shelley D. Best, music by Minister Troy Oliver and the choir Integrity, and selections by the Williams College Gospel Choir. On Monday, February 24th, we featured Rika Shabazz ’17 for BSU Story Time. We enjoyed ice cream, cupcakes, and her funny, powerful story. On Friday, February 28th, we packed Dodd Living Room and showcased some of the hottest talent on campus for our annual event Ruby Lounge. Although not technically during the month of February, we closed our heritage month on March 1st with the cosponsored Sankofa Step Show After-party in Goodrich Hall. We also hosted a BSU WCJA Jazz Party on March 15th. The Black Student Union and the Williams College Jewish Association teamed up to host one of the livest, classiest turn ups of the year. The Williams College Jazz Quartet killed it from 10pm to 1am in Spencer Living Room while students danced in styles ranging from swing to the Wobble. We’ve gotten back to Sunday general meetings after a break for BHM. On Sunday March 9th, we discussed Black Hair at Williams—how to thrive here from the roots on up. Then on Sunday March 16th we welcomed representatives from ACE to discuss representation and collaboration between our groups. Lastly, The Williams College Black Student Union is happy to announce that it is holding its first Black Solidarity Conference! Explore “Black Leadership in the Modern Age” from Friday April 11th to Sunday April 13th! The conference will highlight different facets of black leadership both in the past and the present. We will feature activist and intellectual Ms. Angela Y. Davis as our keynote speaker. Believing in that procrastination can (occasionally) be a productive habit, I’m going to talk about this poster I keep seeing. I used to find this image both hilarious and insightful but, in reality, it’s not. It’s an attempt to channel understandable frustration into snark that unintentionally shows how much people don’t get how oppression works. Institutional racism (or any marginalizing ideology) isn’t going to evaporate because we’ve supposedly progressed as a nation or won a few battles in terms of civil rights and equality. People who have power are not going to be easily be convinced that giving it up is the right thing to do. Images of diversity in schools or in the workplace alone do not address why diversity was fought for in the first place. Likewise, one only has to look at how quickly any discussion of race and/or racism becomes Pulling the Race Card™. Preventing discussion and erasing difference through ideas like colorblindness are now fine-tuned tactics to keep us ignorant of our past and our present. We have to acknowledge contesting narratives and participate in difficult conversations to both understand and effectively address today’s problems. Knowing what I do now after courses like Haiti: In History & Imagination and Civil Rights to Black Power, I can’t buy into the idea that intellectual progress (whatever that is) as a society or the passage of time would have counteracted racism. As long as people are being victimized, struggle should exist and that’s not a bad thing. The fact that we’re addressing similar (if not the same) issues is not unbelievable to me because of how racism is still embedded in American society. And what if we were to eventually overcome oppression? 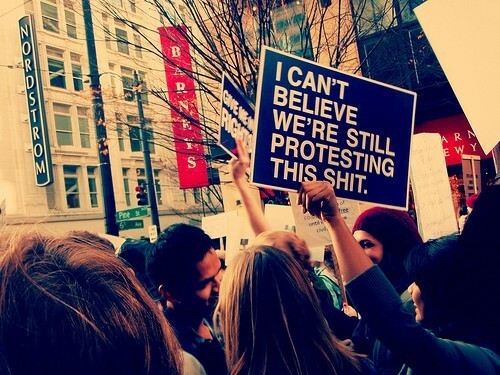 Protest should still exist because a critical eye is essential to progress. Progress should never be a fixed, linear goal: we should never stop striving to be better as individuals, as communities, as a nation. We want to be respected for our racial selves. We don’t want to do away with race, contrary to popular belief…Embrace race, because there is no getting over it. The only way out is the way through.